Morning Motivation — Are you directing your life? You are the star of your own blockbuster movie! You write the script, you choose the locations, you choose your leading lady or leading man, you choose your supporting cast. You are the director. Direct your life in the direction you want it to go! Direct your health towards longevity and feeling good. Direct your relationships in a way that is right for you. Direct your finances towards security. Direct your career where you dream of it going. Direct your thoughts so they make you smile. You are in control! You decide when to say, “action.” You decide when to say, “cut.” You have so much more power than you realize. Use it. Start directing your life where you want it to go from wherever you are with whatever you have right now. 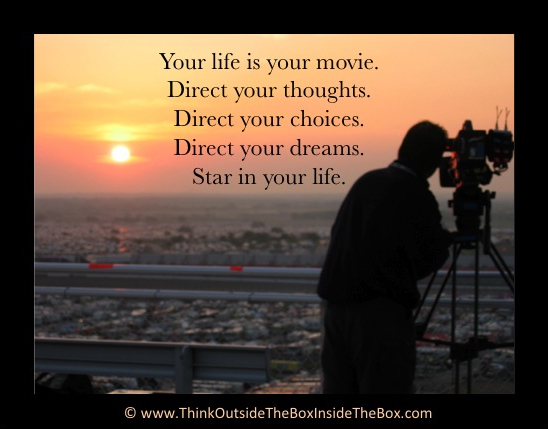 Your life is your movie.